The slimline New Living Translation text Bible is the perfect size for busy teens to carry with them wherever they go now available in new trendy TuTone designs. 8.00" x 5.75" x 1.00"
NLT Teen Slimline Bible Imitation Leather Hot Pink by New Living Trans 2 was published by Tyndale House Publishers in March 2012 and is our 9293rd best seller. The ISBN for NLT Teen Slimline Bible Imitation Leather Hot Pink is 9781414363288. Be the first to review NLT Teen Slimline Bible Imitation Leather Hot Pink! Got a question? No problem! 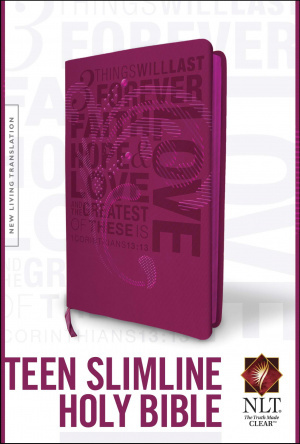 Just click here to ask us about NLT Teen Slimline Bible Imitation Leather Hot Pink. What is the font size please? A:This Bible uses an 8 point font size. "I love this bible. This is my pulpit bible. The one I use to study and preach with. It's light but the print isn't too little to read. And that's one top of the amazing NLT translation." "This bible is perfect sized, not too big or too small, nor is it heavy, big or bulky. It lays flat and the font is just the right size. I tried many other bibles and the font was either too tiny to read or the book was too thick and heavy." "It says it is a teen bible but I am an adult and it works fine for me. I love the hot pink colour! I also love the NLT translation, it makes understanding so much easier! I may just buy a second one for when this one wears out."